Chapal highlights its new collection in a campaign that revives its origins. A big thank you to the teams who embellished our Chapal outfits! For this edition, Chapal accompanied the only Chinese Tour Auto crews, driving a Mercedes 230 SL Pagoda and a Porsche 904 Carrera GTS! It's in Crocq, birthplace of Maison Chapal, that the new Autumn Winter collection was shot. The brand has chosen atypical and charming locations, closely linked to its own history: the former manufacturing factory, which in the 19th century employed more than 200 people, and the majestic family castle located in the middle of a lush green park. Flashback in pictures on the photo shoot marking a new identity for the French brand created in 1832. Exclusive collaboration with stylish Guglielmo Giovannoni during Pitti Uomo. Highlight of the Winter 2019 collection: a very long white rabbit fur coat. Jean-François Bardinon, President and Designer for Maison CHAPAL explores new horizons and imagines a capsule collection in collaboration with artist Bastien Jacquemart. A bold project born from a meeting in New York. Dancer, singer and actor, Bastien breathes his energy and creativity into this Summer 18 wardrobe. The result is a collection with theatrical inspirations, offbeat and dreamlike, both classic and whimsical. Strong, voluminous and graphic pieces accompany body movements with grace and harmony. This new ambassador choice illustrates the desire of Jean-François Bardinon to surprise and innovate. It's also his way of proving that CHAPAL is not just a fashion House. It is a whole universe, evolving in the sandstone of generations since 1832; a universe that does not obey the rules of fashion, but follows the inspirations of its leaders without constraints, a mixture of culture, encounters, know-how and passion. With this collaboration, CHAPAL maintains the close link it enjoys with the arts and demonstrates its artistic approach. The brand already has under its direction two art centers located in former tanneries; a way to preserve the industrial memory and to give a chance to some great and diverse talents to express themselves. New collaboration between CHAPAL and The Rake - the luxury magazine dedicated to masculine elegance. After reinventing the timeless design of the iconic USAAF, the A1 'suzy' velvet leather jacket is in the spotlight this winter. A unique collaboration between two Houses that share aesthetics, ideals and a desire to reach perfection. They chose to highlight the first model in aviation history: the A1, originally designed by the Army Air Corp in 1922 to replace jackets that were too bulky to fit in cockpits. An already iconic piece for the French brand created in 1832. It is available here in velvet sheep leather (the full grain leather has been very gently buffed), with a golden cotton poplin lining and ribbed collar, wrists and waist. With its slim fit, natural horn buttons and bright "suzy" color, it is an elegant and timeless item. If the A2 jacket renders an extremely sophisticated look when combined with a shirt and tie, the effortless elegance of the A1 goes perfectly with more casual outfits like a denim shirt or long sleeve polo shirt. Each piece is entirely manufactured in the CHAPAL workshops. The A1 jacket is available now from CHAPAL and The Rake's E-Shop. 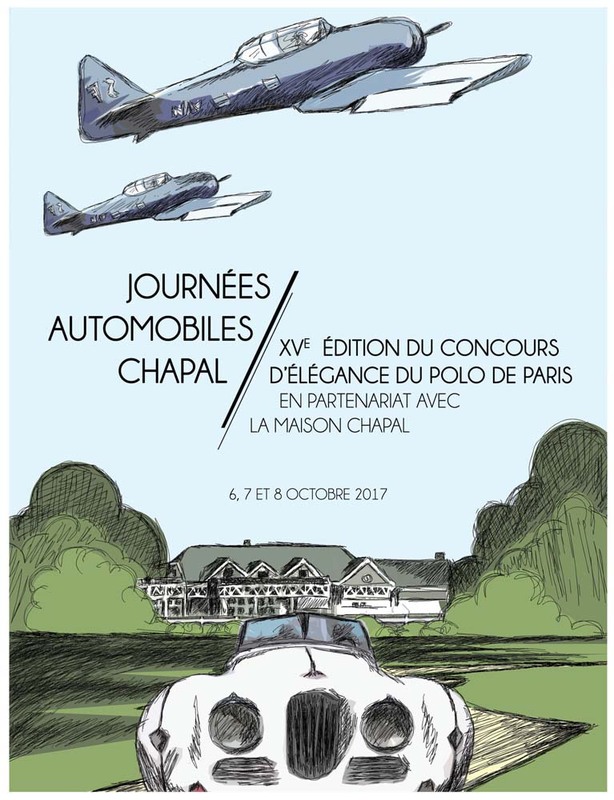 This weekend, CHAPAL held the 1st edition of its Motor Days in partnership with the Polo de Paris. An intimate event combining the best of elegance and car passion. The start of the rally took place on Saturday morning at the Polo to join the Compiègne Aeodrome. A 160km journey through the colorful and hilly landscapes of Vexin, guided by Paul Belmondo, CHAPAL's ambassador, driving a 1967 Porsche 911 T.
Participants were welcomed by Frédérick and Alexandre Collinot from the Flying Machines Circle Association. A team of enthusiasts reviving the memory of the French aviation, through the renovation of planes designed before 1940. The crews lunched in the hangar - privatized for the occasion - under the wings of these legendary flying machines: Morane-Saulnier 181, Potez type 60, Stampe SV4, Piper J3 ... On the menu: specialties from the Creuse region of France, a nod to CHAPAL's birthplace. In the afternoon, guests discovered the incredible reconstruction of Jean Mermoz's plane: Latécoère, and enjoyed flying demonstrations. The day ended at the showroom, with a cocktail and buffet orchestrated by Luana Belmondo. On Sunday, participants attended the 15th edition of the Concours d'Elegance of the Polo de Paris. Nearly 25 pre-war automobiles were selected by the Commission des Chevaux Vapeur (Steam Horses Commission), chaired by Jean-Marc Huyghues-Despointes. Elegance, authenticity and presence during the whole weekend. After a few years of interruption, the Polo de Paris gave me the opportunity to restart the CHAPAL days by asking me to organize auto meetings. In the CHAPAL state of mind that is mine, I want to gather mechanics enthusiasts, who enjoy driving and exchanging with those who wrote automobile history. I would like to meet you with your most beautiful cars Friday 6th October on the lawn of the Polo de Paris for the briefing and an opening dinner. The rally will start on Saturday morning to join the Compiegne aerodrome and share the pleasure of riding together, a traveling mechanical museum gathering vehicles and motorcycles of all ages. The Compiègne aerodrome and the Association du Cercle des Machines Volantes with Frédérick and Alexandre Collinot will welcome us exceptionally, surrounded by their WWI aircraft collection. In the hangars, a chef will orchestrate our lunch consisting of products from the Creuse. We will celebrate the centenary of the death of Georges Guynemer, a pilot native of Compiègne. The afternoon will take place on the tarmac, where you will be able to ride on a circuit of bales of straw, fly in the planes of the Circle, discover the incredible reconstruction of Jean Mermoz's plane the Latécoère, simply living your passion. In the late afternoon we will park our cars on the lawn of the Polo de Paris and join the Showroom CHAPAL, for an evening dressed in pilot outfit in an intimate gathering. On Sunday from 9am, you will attend the 15th Edition of the Concours d'Élégance of the Polo de Paris while your cars will enter an OFF contest. We will mix genres and styles, just the way I like to do it. The goal of this new edition is to create an intimate atmosphere, I can only advise you to join us to share our common passion. The designer Wales Bonner has called on Maison CHAPAL to manufacture the leather pieces of her Fall Winter 2018 collection. A collaboration that combined two different worlds. To reconnect with its avant-gardist past and its hours of glory in the US, Maison CHAPAL continues its adventure on the American continent! Back in 1881, Emile Chapal does not intend to confine the company to French national borders. An ambitious and innovative character, he sets out to conquer this immense country where dreams come true and where there are opportunities to make a fortune: America. Emile then embarks aboard the majestic liner Île-de-France, true "greyhound of the seas" that could cross the distance between Le Havre and New York in 10 days. He does not leave alone: his wife and 10 French workers accompany him. They will become the executives of the tannery that CHAPAL was firmly dedicated to operate in America. In 1881, the enterprising Emile founded C & E Chapal Brothers & Co. Inc. in Brooklyn (NYC). First factory established for the treatment of French leather and skins, it will quickly become the most important and the most famous in the United States. The city of New York has naturally established itself as the culmination of this Fall-Winter 2017/2018 collection. Its streets, architecture, nightlife and the history of CHAPAL are all elements that have inspired Jean-François Bardinon. He creates a collection that reconciles casual style with chic French fashion. Let CHAPAL take you to Brooklyn, in a mysterious atmosphere between dizzying skyscrapers, the intoxicating Manhattan skyline and enigmatic disinfected areas! The Brooklyn Vibes Atmosphere collection is full of contrasts, in the image of this multi-faceted cosmopolitan city: between luxury and functionality, elegant details and rawness of the materials. An intense adventure in a Royal Enfield on the frozen lake of Khövsgö! Adventurer and writer Sylvain Tesson has embarked on a new challenge. He joined six comrades for a new mechanical adventure: crossing the frozen Khövsgöl lake on Royal Enfield sidecars in extreme conditions reaching -40 °! They went to meet reindeer herding Tsaaran tribes, and Mongolians present at the ice festival which takes place every year in early March. To withstand the extreme cold (on a motorcycle, at -40°, the skin can freeze in less than a minute! ), CHAPAL dressed our seven adventurers with pants in warm and resistant sheep leather. Michelin unveils a unique web series that highlights some of the best craftsmen in the world. Each episode illustrates the meticulous actions that lead to excellence and allow you to enjoy the perfect driving experience. Whether it's the driver's favorite watch, leather jacket, sunglasses or the music that becomes the soundtrack of memorable travels; these innumerable details make the moment magical. Because every gesture counts to reach perfection, the 1st episode, "Empathy", takes us with poetry and emotion in the meticulous world of leather craft, in the heart of the workshops of the CHAPAL House. To illustrate classic cars and feminine elegance, CHAPAL has chosen Rosemarijn Atalante Veenenbos. A passionate and charismatic woman who perfectly embodies the values of Maison CHAPAL. Check out the 13 episode series: Atalante's Quest. The beginning of 2017 marked the beginning of a collaboration between CHAPAL and The RAKE, a magazine entirely dedicated to masculine elegance. Together, they presented a contemporary version of the iconic USAAF. Inspired by the US Air Force's A2 and G1 jackets, it is one of the most popular models of the 1930s, formerly made from goatskin or cowhide. A historic jacket worn proudly by a generation of aviators. CHAPAL offers here an authentic version, conform to the most iconic leather jacket of all times. Designer Jean-François Bardinon nevertheless added some subtleties to make it a contemporary and elegant flight jacket. The USAAF jacket is distinguishable, among other things, by its imposing detachable golden sheepskin collar, large pockets and glossy sheep leather selected and precisely patinated in the Maison's workshops. " This jacket is a tribute to the military jackets of the time, but it is also the ultimate expression of French expertise and craftsmanship". In close collaboration with The Rake, CHAPAL creates a lighter version with a sleek and modern silhouette, while of course retaining all the original iconography of the authentic USAAF, including the legendary pleats that allowed pilots a certain ease of movement. This new version is offered in the original color, a bright brown that matches harmoniously the camouflage printed quilted silk lining. This exclusive model is both an awakening of the past and the ultimate expression of French craftsmanship. For the second year, Dandy's Nights at the Hôtel Plaza Athénée brought together a dozen companies from various universes, who have one thing in common: exceptional know-how. CHAPAL unveiled the secrets of its Mosaic collection through a workshop of marquetry. A meticulous technique, borrowed from ceramics, which consists of attaching small pieces of leather on fabric. This Mosaic collection was imagined in order to use 100% of the raw material and participate in the commitment of sustainable production. CHAPAL offers an infinite possibility of decoration with the smallest pieces of leather. Mainly used for luggage, CHAPAL also applies this technique to shoes and jackets. The Aïcha des Gazelles Rally is one of a kind. Every year since 1990, it brings together over 300 women aged 18 to 65 and more than 30 nationalities in the Moroccan desert. Characterized as the only rally raid 100% feminine, this orienteering develops another vision of the automobile competition: no speed, no GPS, old-fashioned navigation, only off-trail for a true sense of adventure. Without any selection other than their determination, whatever their age or their environment, their nationality or their experience, the participants of this rally come to drive a 4×4, a crossover, a quad, a truck, a motorbike... A unique competition where the true values of tolerance, perseverance, and solidarity prevail. Each year, CHAPAL accompanies crews, to encourage competitiveness and sportsmanship. CHAPAL, always faithful to Rétromobile! Rétromobile is the show for enthusiasts, curious or lovers of vintage cars: more than 500 vehicles on display, 500 exhibitors, 120 clubs, 45 artists and many exclusive animations gathered in the "Galerie d'Art Automobile". Always passionate about automobiles, Jean-Francois Bardinon, President and Designer of the Maison CHAPAL, invests the Salon Rétromobile to present the latest novelties and timeless pieces inspired by this world that is dear to him. CHAPAL opens the doors of its universe on this elegant and authentic stand. A major gathering for men's fashion players. Fashionistas, bloggers, journalists and professional buyers come to discover the next trends and the latest novelties of the big ready to wear brands. It is in the Make section that CHAPAL unveils each year its new collections: a place dedicated to the rediscovery of crafts, and exceptional products. [Spotted] Sport jacket, worn by Italian blogger Danilo Carnevale! CHAPAL chose Marco Parrino to present the FW17 collection at Pitti Uomo. The Maison CHAPAL accompanied Renault for its event Le Volant des Chefs (the steering wheel of chefs). Over two days, 21 chefs and 10 drivers traded places: the pilots cooked a set meal, and the dishes were tasted and rated by a jury chaired by award-winning chef Christophe Bacquié; and the chefs performed driving feats on the Paul Ricard du Castellet track. After creating sporty zipped jackets last year, CHAPAL proposed for this 2016 edition a line of exclusive bags specially designed for the event. Soft sheepskin leather bags, golden yellow or indigo blue versions that seduced pilots and starred chefs. CHAPAL was present alongside its ambassador Paul Belmondo, who donned his overalls for the occasion. Last night, the Maison CHAPAL unveiled a preview of some of its next Fall-Winter 2016 collection, alongside Land Rover presenting its new Range Rover Evoque Cabriolet. An unforgettable evening associating two brands in an exceptional venue. Set in the center of Paris at the heart of the fashion district, the CHAPAL Showroom was the ideal place to combine the two refined worlds that are Fashion and Automobile. This partnership has relied on the major assets of CHAPAL and Land Rover, their common taste for elegance, beautiful materials and neat details. Jean-François Bardinon, President and Designer of the luxury Ready-to-Wear brand presented the Fall Winter 2016 collection dedicated to the man of today, in search of absolute refinement and authenticity, and unveiled in preview some feminine pieces. The collections on display in the CHAPAL Showroom matched the contemporary and unique design of the Range Rover Evoque Cabriolet. The Range Rover Evoque Cabriolet staged in the middle of the courtyard and CHAPAL's accessories seduced the guests. 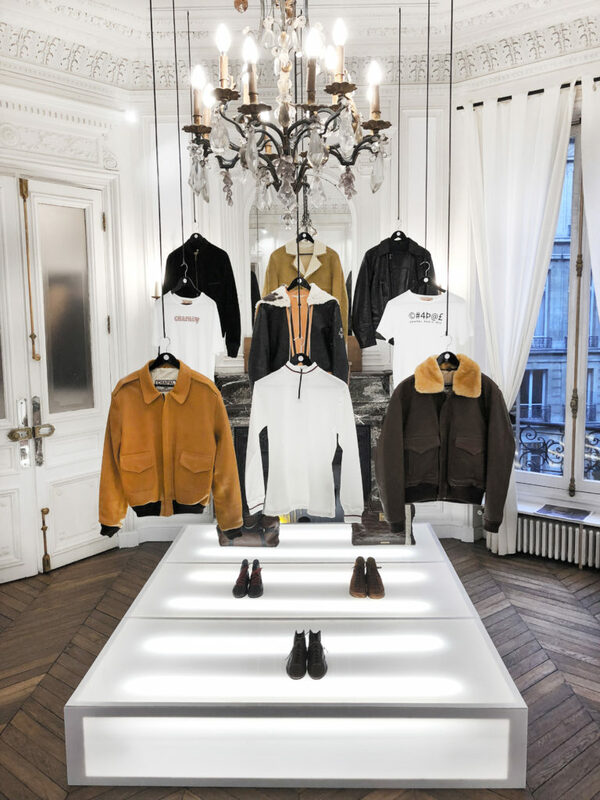 Jean-François Bardinon presented key items: short sheep leather sailor coat, smooth velvet blazer and some exclusive pieces from the Capsule Collection "Morisson" associating denim and shearling sheepskin. Among the feminine pieces unveiled, the focused was on a majestic long coat in blush pink shearling sheepskin. Just push the door to number 244, rue de Rivoli and climb a few steps to this Haussmann apartment and be transported into the world of Maison CHAPAL. A refined setting in the heart of Paris and close to the legendary fashion district.